Because we build your skiff to order, you have complete flexibility in options and rigging. Want to buy a bare hull and hang your own engine? We can do that. Want us to do everything short of putting bait in the well? We can do that too. Ankonas are available with a range of steering options, from a simple tiller-steered outboard to a full-featured center console with jump seat. In addition to several center consoles, tiller consoles, and tiller grab bars, side consoles are available on some models. Built-in guide boxes are also popular. They can be used as dry compartments, coolers, or livewells and can be fitted with grab bars. Power options are up to you. You choose the manufacturer, horsepower, and model, and we'll quote you a price and rig your engine expertly. You can also choose any non-metallic color on the Awlgrip chart at no additional charge. Out current pricing sheet is the best source of information about available options. 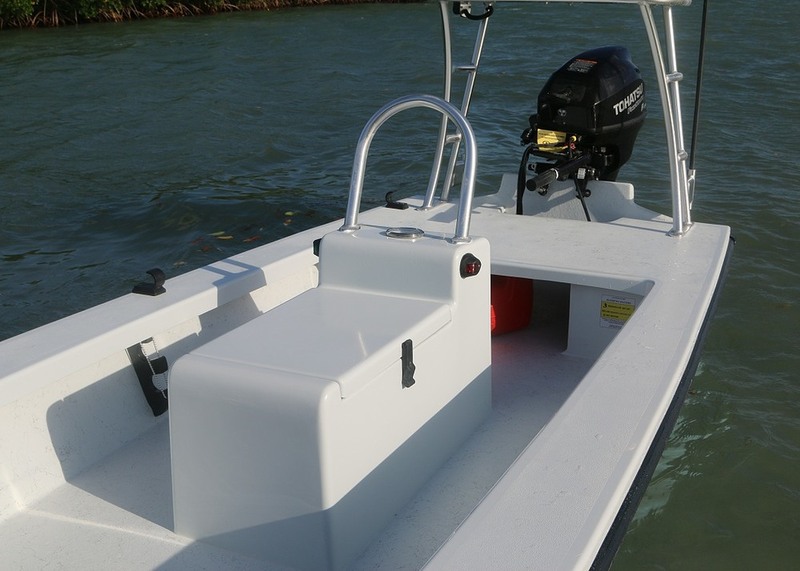 Popular choices include built-in aluminum fuel cells, poling and casting platforms, a variety of rod storage options, electrical and lighting packages, jackplates, and trim tabs. Please don't hesitate to call us with questions about options and rigging.